Very often, when friends ask me when I'm going to be ordained, a comment about the great length of Jesuit formation is made. "Almost eleven years? Why does it take so long?" Although the formal "training" process to prepare a man for ordination to the priesthood takes a Jesuit nearly ten years, the truth is that it is a process with roots in my childhood. From an early age, I knew very little other than I wanted to be happy in my life. I have been graced with many great opportunities and am quite assured that, were I not a Jesuit, financial concerns would be the least of my worries. I could have been a doctor or a lawyer, although as much as these would appeal to my ambitious side, I could well imagine that I might have become a special education teacher. Yet my draw toward happiness found models in the Jesuits I knew at Saint Ignatius High School, Canisius College, and John Carroll University. These were the kind of men I wanted to be like, the sort of men who seemed to be happy. When I entered the Society of Jesus in 2004, ordination seemed a very long way away. Novitiate, First Studies, Regency, then Theology....so many stages, so many years. Instead of focusing solely on the end result, as some "light at the end of the tunnel," I have tried to stay focused on each stage of formation, trying each day to come to know Jesus better and to serve him in God's people. 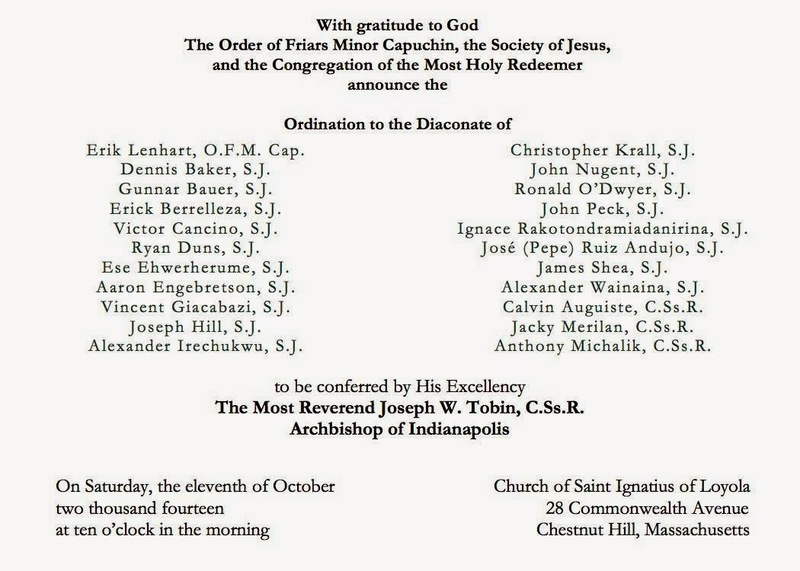 I mention this because, this Saturday, I'll be ordained to the transitional diaconate. Priestly ordination will take place next June 13th in Chicago. Truth be told, between starting my PhD and recently losing my grandmother, this ordination has been too much to think about, so I've put it into the Lord's hands each day. "Jesus, I know this is coming up, but I've got a lot going on these days. You do your work on your end, and I'll keep up on my end, and let's hope it'll all be okay." I'd ask your prayers for all of the ordinands this weekend and next. My prayer is that we are being formed to be the priests the Church deserves and needs.